The second generation Calypsomatic was introduced likely around ~1962 and this was the start of the new and improved design that has become the face of the entire reference. This is where we see some of the features we have come to love about the Calypsomatic. Starting with the dial, we have the introduction of the gilt writing. The early ones will have “Swiss Made” at the bottom of the dial without the “T” to show the use of radium and not tritium. These radium dials are essentially rarer because they were only used for around a year or so and were quickly changed to comply with legislation around 1963 to no longer use radium (The radium and tritium dial for this reference is identical and both are correct) Most noticeable is a new big logo with Titus written below in gold writing. Let us call this dial the "big logo" dial. This is gilt printed over gloss and depending on how your watch aged some appear more gold than others. But it should be gold nonetheless. The gilt includes all the text, frame around the date and hash marks around the dial. 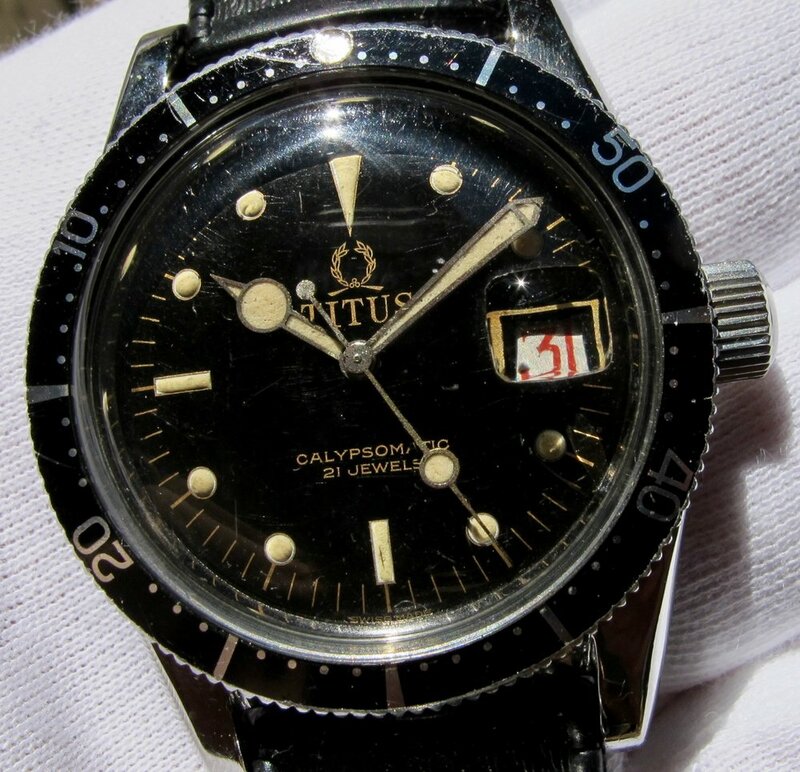 The correct text going from top to bottom is Titus, Calypsomatic, 21 jewels, swiss made or T swiss made T. The markers have a white outline boarder and the luminous material was applied on top. Some references you can see the white circular boarder better than others depending on how the luminous material was applied. Something worth noting is that with these early big logo dials we can see the lacquer has turned matte or a tropical brown color. *There is a big logo dial going around that has "swiss made" at the bottom but is NOT gilt print. You will notice they are often advertised as NOS and do not have any patina. These are not genuine original dials but reprinted dials that were never fitted originally on any Calypsomatic. If you look closely you will notice the font is too thick and incorrect, the spacing is off, the 12 o'clock triangle marker is too long and nearly touches the middle of the logo and the "a's" in Calypsomatic are not flat top. The next noticeable difference is the famous lollipop pointed hour hand with a thick long minute and bubble second hand. The hour hand should be three sections with luminous material filled in each. It starts with the small point on the end, the lollipop circle and arm connecting to the center pin. The minute hand is two sections starting with the triangle on the end and the long arm that gets thinner as it gets to the center pin. The second’s hand has a bubble near the center of the hand and the back end has a non-luminous ball for its counter balance. 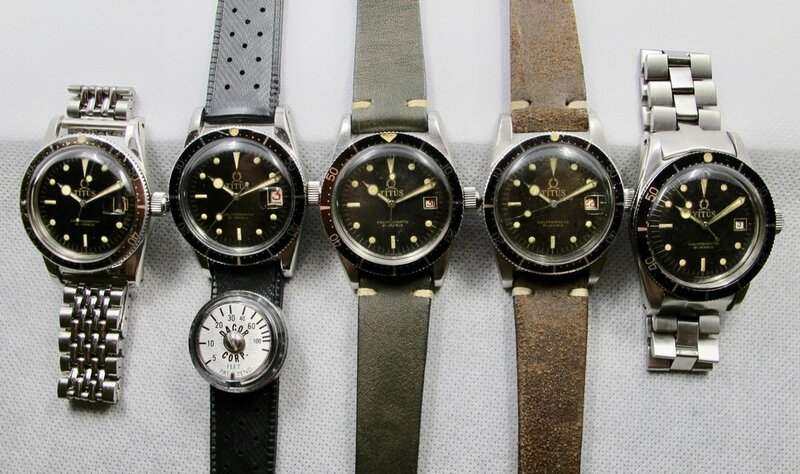 Due to the large lume area on all the hands it is very common to see broken or missing lume. Having them color-matched relumed is a common practice and generally accepted. The hands are stacked from bottom to top in this order: hour, minute, seconds. Another great feature that was introduced on the second generation is what people like to call the “roulette” date wheel. Unfortunately, this is actually incorrect because the alternating color pattern is blue (even numbers) and red (odd) and not black and red. It can be hard to tell from photos but if you own one then you know that the color is blue and not black. The numbers are printed over a white background so the red really pops. 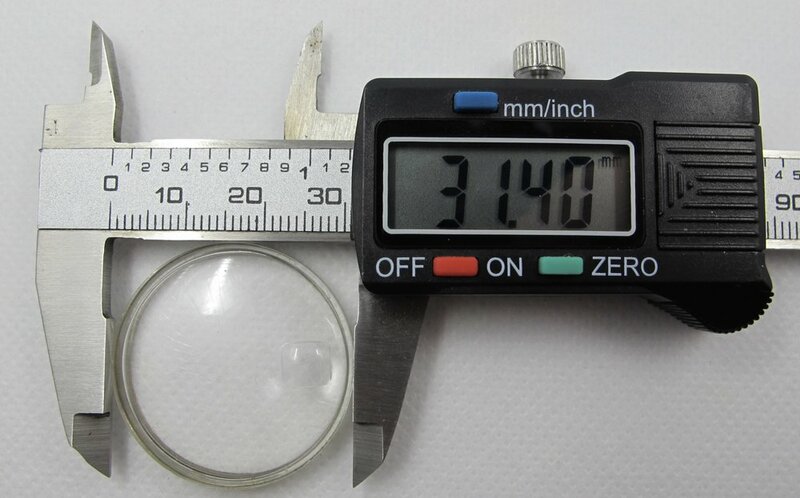 The original crystal should have a cyclops magnifier with a bubble on the outside of the crystal. Expect some crazing and scratches if original. For the early radium dials you would like to see a count down or count up bezel with a circular pip at the center. Generally the circular pip is the correct bezel for the 5913 reference. The case retains its original drilled lug holes and should have 5913 engraved between the lugs at the 12 o’clock area. If the 5913 is not engraved on the case then expect to see it engraved on the case-back. It should have one of these markings to be considered a correct Titus case. Perhaps the most important or eye catching for some is the introduction of the “big crown”. It is generally accepted that the big crown was introduced in the second iteration of the 5913 and not the first generation. This crown is unsigned with a small circular bump on the end and measures ~6.7mm and is more of a push in style with a slight screw down. The stem is a two piece male and female that attach to each other. Don't be surprised if you have a one piece stem that was modified to fit because the two piece design was fragile and weak. The movement is an upgraded ETA 2472, 21 jewels. The rotor should be signed with “Solvil et Titus” along with the jewel rating. This reference can be seen on an oyster style rivet or a beads of rice bracelet with the logo and Titus signed onto the clasp. A rare clasp with just a large logo has also been seen on this reference with word Titus written on the inside.